Hello dear eaters and readers! Welcome to the first Tasty Tuesday of 2019. 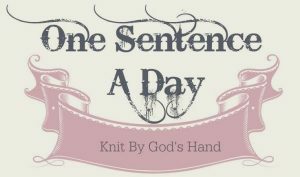 And the first Pinterest Challenge blog hop, which I may or may not have signed up to participate in. I knew I was going out of town again so may not have signed up, but here I am, still at home. Whadaya know! 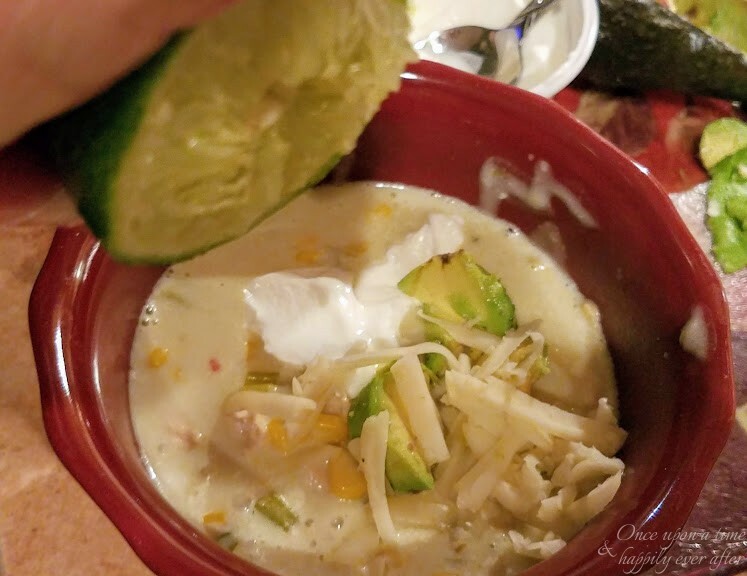 So I am linking up with Erlene and the Pinterest Challenge blog hop gang to share my pinspired green enchilada chicken soup. After gaining about 7 whopping pounds over the holidays…lots of emotional eating going on…PC has put us back on ‘soup diet’. He requested soup last night and I gave him 3 recipes to choose from. He chose this green enchilada chicken soup. I generally prefer to simmer my soups in the crock pot all day but this soup is prepared on the stove, and in record time, I might add. 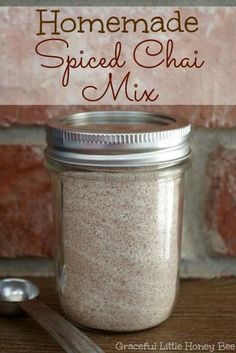 It would probably work well in the crock pot or even the Instapot; will experiment with that next go-round. So, for today, grab your stock pot and ladle then meet me in the kitchen. 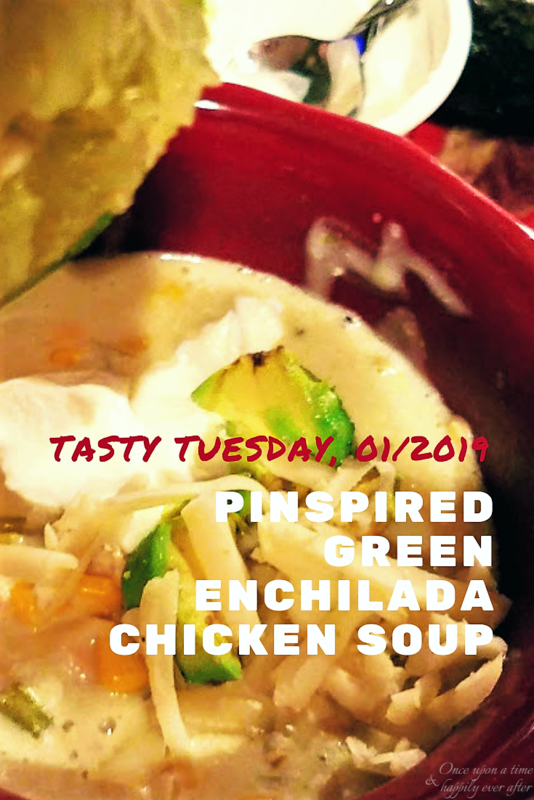 Tasty Tuesday: Pinspired Green Enchilada Chicken Soup. 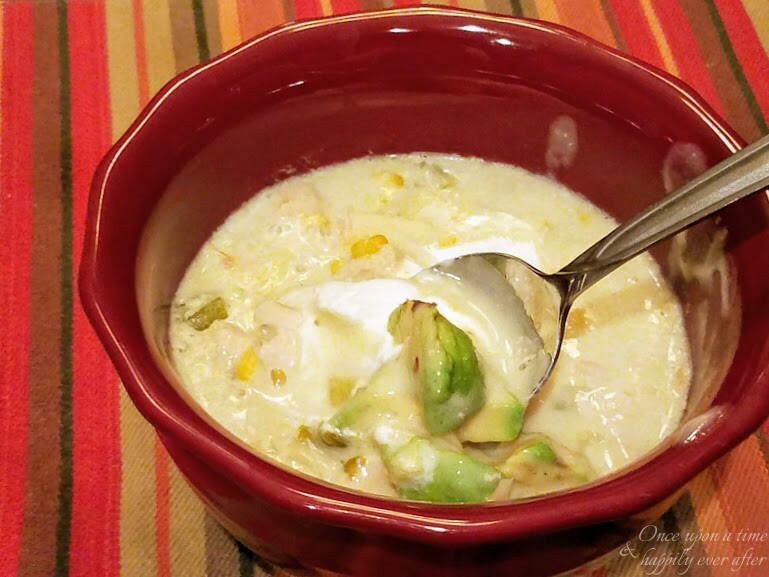 Just like mother made…if your mother made green enchilada chicken soup. Which my mother did not. But I am a mother and I am making it now. This recipe is easy, quick and requires very few ingredients. Most of them I have on hand on a regular basis. Have a look. 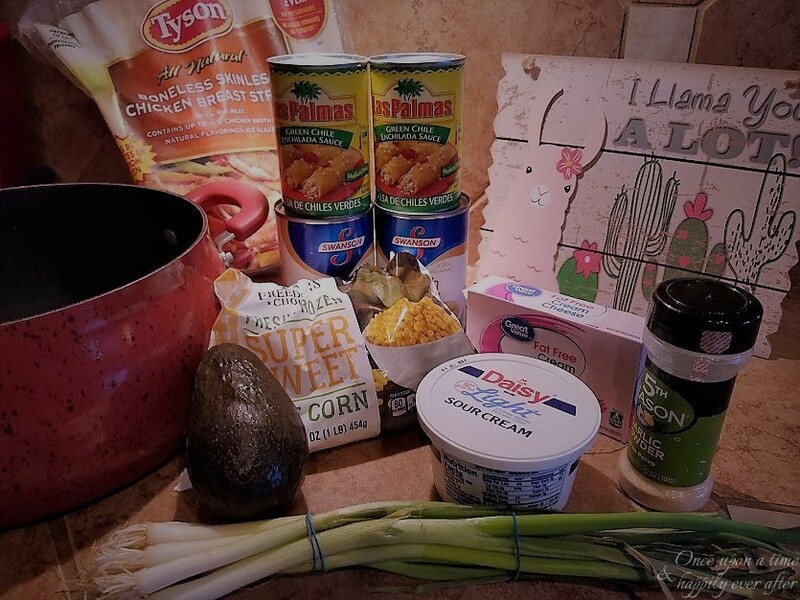 I added the following ingredients, which are not called for in the original Pinterest recipe, shared by Mostly Homemade Mom, here. I always preface my recipes by saying I don’t really measure anything. And as a result, nothing I make ever tastes the same way twice. Ha! For the good or bad. I keep telling myself that I need to break out the measuring spoons and measuring cups but why dirty them up when I can just kind of guesstimate. You know what I mean? Add chicken and 2 cans of chicken broth to stock pot. I used frozen, boneless, skinless chicken breasts so added a cup of water, too. Bring to a boil, then reduce heat to a simmer until chicken is cooked. Remove chicken from pot and shred, using two forks to pull meat apart. Return chicken to the pot. Add 2 cans of green enchilada sauce to the pot. Chop garlic (or use garlic powder), chop green onion and cilantro (if desired) and add to pot. Add green chile seasoning, if desired. Allow to simmer for 15-20 minutes. 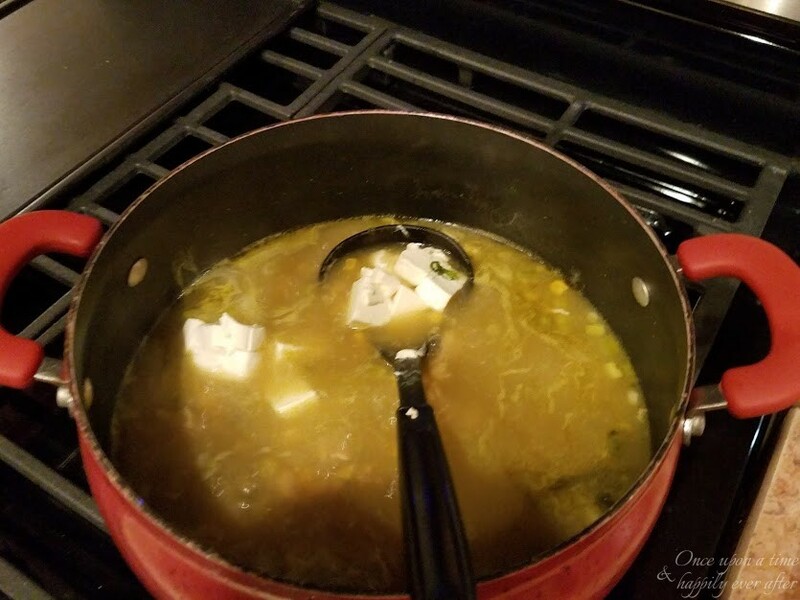 Cut softened cream cheese into small cubes, add to pot and simmer for 10 minutes, stirring occasionally, until the cheese is completely melted. Add pepper jack cheese, if desired. Stir occasionally and allow to simmer until cheese is melted. 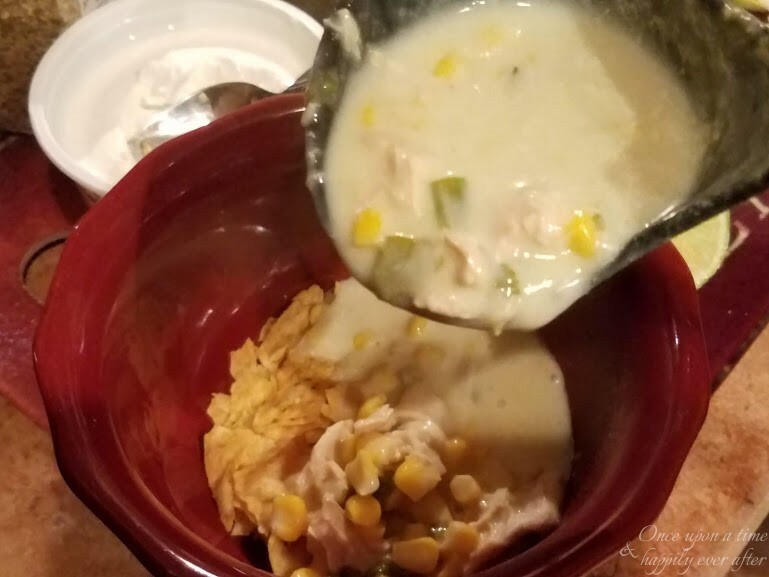 We added some broken tortilla chips to the bottom of our bowls, then ladled in the soup. Serve topped with avocado and a dollop of sour cream and a few sprinkles of grated pepper jack cheese and a squirt of fresh lime juice. Add a spoon and dig in! Since we are on PC’s ‘soup diet’ right now, this was all we had for dinner. I would say this makes about 6 servings. We each had 1 1/2 generous bowls full and have at least that much left for Thurday leftover day. It is approximately 8 Free Style Weight Watchers points per bowl, made with fat free cream cheese. 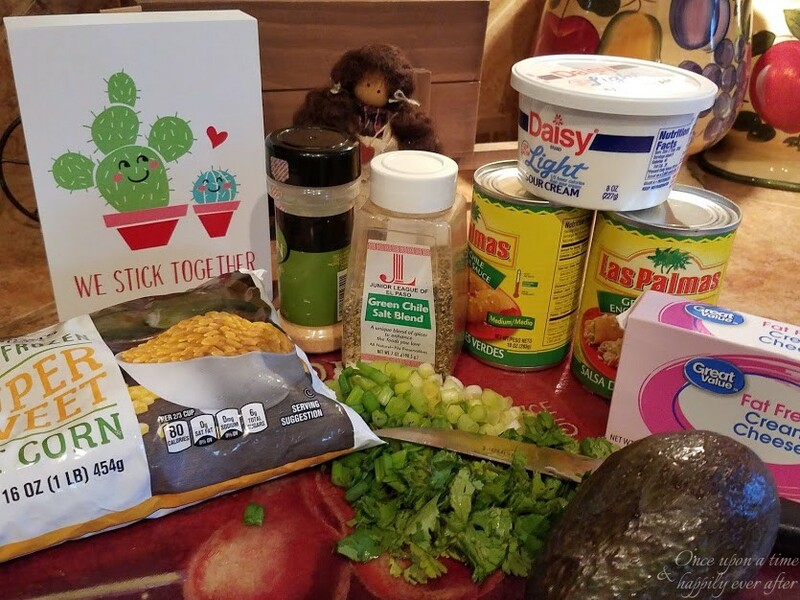 Green enchilada chicken soup could be paired with a quesadilla or rolled tacos or even just a green salad to make a more complete meal. It is really, really, really good. Really. Good. Are you guys soup eaters at your house? If so, you have to try this recipe. Hearty, delicious and a quick, easy meal. You might also like my crock pot creamy sausage potato soup or crock pot pizza soup, which we had last week. 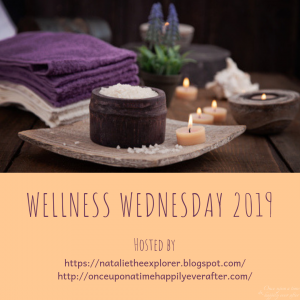 If you have a pinspired post to share, won’t you link up with us below? Would like to invite you to follow my blog Facebook page, here. A few months ago some of my faithful friends shared their fav soup recipes on the Facebook page. Lots of inspiration there from my sweet buddies. Oh, and my Souper Chili and Stews Pinterest board is loaded with great recipes. Would be tickled to have you follow me there. 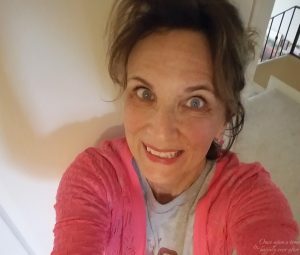 Hope you will run by to visit some of the gals linked-up for the Pinterest Challenge blog hop, too. 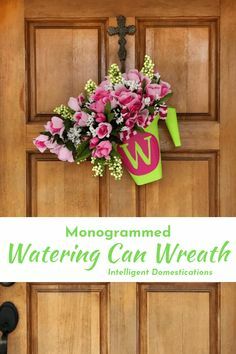 I am always impressed with the fabulous ideas shared through this this challenge. Pretty sure you will be, too. We’ve been making one giant pot of different soups per week. And yes, we eat the soup mostly all week long! Tuscan Bean Soup. Minestrone. Pasta Fagioli (beans & pasta in a chicken broth base) Butternut Squash Soup. Chicken Noodle. Today I made split pea soup. Next Monday I’m making lentil soup. I really like the soup you made. I have to try it. I have some of the ingredients already. I do make a mean taco soup! I made that last year when I was living in Florida. It was a big hit! Mmmm, I need your butternut squash soup recipe. 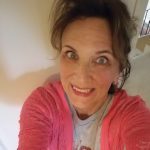 Would you leave it on my blog FB page? We have several good soup recipes over there. And maybe the minestrone, too, if you can just copy and paste them easily. Don’t go to a lot of trouble but I know folks would appreciate them!! Hi, Leslie – This looks delicious. I am also a soup lover and usually simmer soups all day in my crock pot. My husband is okay with soups — especially plain boring ones (read here ‘tomato’ or ‘non-spicy vegetable’). It would be fun to serve him this one and see what he thinks! Thank you for sharing this recipe. You know what, dear friend? This green enchilada soup wasn’t spicy. Just a little zing but most of that was from the lime we squeezed into it. My PC is the king of stomach issues…Mr. Nexium, himself. Well, actually not, because if he took his Nexium, his stomach wouldn’t hurt!! If you give this soup a go, let me know! Mmmmmmm this looks so good. 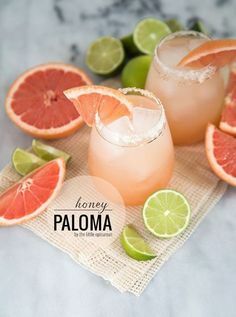 I am pinning this recipe, I think my husband and I would love this. I gained 6 pounds over the holidays and it is taking a sweet forever to get back on track. Why is it so easy to gain and so hard to part with? I mean really, am I that much fun to be with that the fat can’t bear to leave me??? Ha!!! Kellyann, please try this green enchilada soup! Oh, it is so good. PC requested it again already! I am pretty darn certain you are a lot of fun and most anyone wouldn’t want to part ways with you…but I am also pretty darn certain there’s nary an ounce of chubs on you. You look spectacular! Looks delicious! I think soup is on everyone’s mind this week! I’ve seen several posts today with yummy soup recipes and I have to say that it’s the perfect weather for it here in Louisiana! Enjoy your day! I have seen a couple of soup posts, too. Your bff had one that I promptly pinned. I could eat soup every night for dinner. Just something about it! Must be that time of year – everyone with their healthy new year intentions turning to soup making! I made minestrone last week, so tasty and comforting. Weather here is definitely turning colder, perfect soup weather. Yours looks delicious and I could really eat a bowl right now! Oh, Debs, would you share your minestrone recipe? If it is something you can easily copy and paste would you add it to my blog FB page? We have about half a dozen soup recipes there and love that everyone is sharing. I know it is good. Oh, your pup looks adorbs today on Instagram, all cleaned up and fluffy!! I’ve never had green enchilada soup, but this looks so comforting with all of the snow we’ve gotten. 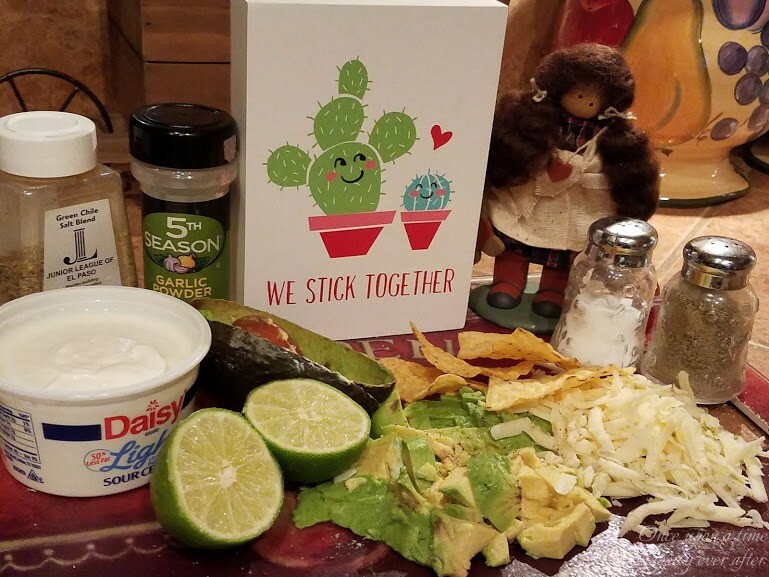 I just love that cactus sign. 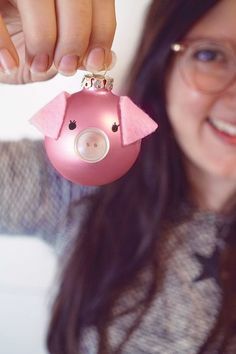 🙂 So cute! You guys have more snow? We have just had a bit this year. Since we did get a few flakes, I am ok if we just move on into spring. Please, oh, please try this green enchilada soup, Carrie. It is like a Mexican dinner in a bowl! I made some chicken tortilla soup last week that the whole family loved. I think this looks delicious, especially the creamy texture! I definitely need to try this later! Was your tortilla soup a clear broth? Or at least not creamy and thick? I need a good chicken tortilla soup recipe. Would you share? Always happy to have new soups to try.